A letter was sent to George Fairchild of Chicago, IL in 1956, requesting permission to install a “modest flower plot” in the triangle bounded by Highway 77 and his property. This would be where the present Clam Lake park is, next to the Clam Lake Junction. George Fairchild was the father of Pat Paulsen of Clam Lake and grandfather to Scott Straetz of Park Falls. At that time he owned the entire island where the Junction sits now. “Your communication has been received and acknowledged. Regarding the subject matter, I will discuss this with you on my next visit to the Community. May I take this opportunity to congratulate you upon the splendid Community spirit you are showing, and upon the progress that has been made this winter by yourself and your associates, regarding the Community building. Trusting all is well with you and yours, and wishing you and your associates the best of luck in your endeavor to make Clam Lake a bigger and better Community for all concerned. Even though this letter sounds optimistic, in subsequent letters and communication the request to place a “modest flower plot” was always denied for reasons unknown. Perhaps Mr. Fairchild had a grand plan to do something with the Island without the interference of flower plots. We can only guess. In the late 80’s, with a Scenic Byway dedication wanting a place to hold their ceremony and Clam Lake wanting to be that place, once again the idea of a “modest flower plot” was brought to light. Once the ok was given, it was “full steam ahead”! Thus began hours and hours of donated labor by the Clam Lake community to construct the lovely park area that sits there today. Lea Justice told me a story of the many volunteers working past dark. In order to continue with the project, they would aim their cars at the park area and turn on all their headlights so they could see. We are talking dedication and possibly a few low car batteries! Many people worked on the Park project and we are thankful to all of them for their contributions. It was finished just in time for the Great Divide Scenic Byway dedication in 1990. It was also the scene of the ceremony to commemorate the elk being reintroduced to our area in 1995. Our Memorial Board with plaques of remembrance for Clam Lakers that have passed on is part of the Park, as is the Elk Kiosk established by the Rocky Mountain Elk Foundation. George Fairchild passed away in 1991. When we look at the park we must remember him and what he ultimately gave to our community in both story and park. When Tim and Tammy McFadden bought the land in the 90’s and built the Clam Lake Junction, they donated the Park to the Clam Lake Community Club. At long last, the “modest flower plot” was a mission accomplished! 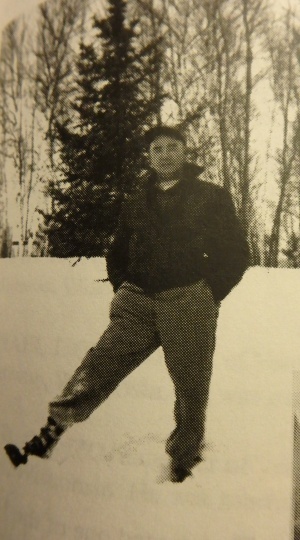 Pictured is George Fairchild in 1956.